katana disassemble good or bad? I am up to two swords now, the first one in need of repair for a slight edge roll, and a sharpening. There are many posts on disassembling katana, to inspect tsuka for cracks, or customizing, and for sharpening the bare blade. But I have also seen where it says repeated disassembly can lead to an overall loosening of the sword components. I've also read that people advocate gluing the tsuka onto the sword permanently. 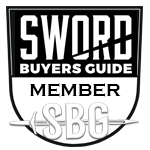 Before I start teaching myself sword disassembly and blade repair and sharpening I want to make sure it will not lead to problems down the road. I know there are many great people that can help on this site, so thanks in advance. I'm one of the keep it epoxied permanently guys when it comes to low cost kats. In order to glue it up you have to take it apart completely once which lets you inspect for cracks etc.. Then once you know what you've got under the hood you can put if back together for good. It's easy to sharpen an assembled blade using a belt sander but if you are going to be sharpening by hand using quasi old school methods that is easier on a bare blade. I usually disassemble my production kats before the first-use to inspect and fix anything (that is fixable) that might cause loosening from cutting heavy/hard targets. I've had some swords that seemed tight and solid, but had huge cracks and/or seam separations in the core. If you take the sword apart properly, there isn't much to worry about. If you don't know what you are doing and clumsily hammer the thing on or off you're likely to cause problems. If you pathologically disassemble and reassemble the thing over and over again then sure it will loosen up on you. It will also loosen up eventually with use over time. I'd be far more concerned about not being able to periodically check the sword for issues than a slight click or rattle here or there.